One of the best ways to spend time with family is to go on a camping trip together. You can share stories around a campfire, cook breakfast in the middle of nature — you can even teach your kids how to fish! Most importantly however, going camping is a great way to get away from the constant distractions and smartphone notifications that can consume modern everyday lives. While it’s certainly nice to have computers and smartphones, its essential that we take a break from them from time to time to reconnect with nature and each other. Whether you’re an experienced camper or you’re considering taking your family for the first time, there are a few key things to remember. In addition to bringing the essentials with you — such as a first aid kit, bottled water, sleeping bags, and food — understanding how to pitch a tent and build a fire safely are things that should definitely be learned before heading on your trip. Personal Creations has designed an easy-to-use infographic which serves as a guide to camping. The infographic includes simple animations on how to pitch a tent, build a fire, and even how to cast a fishing line! 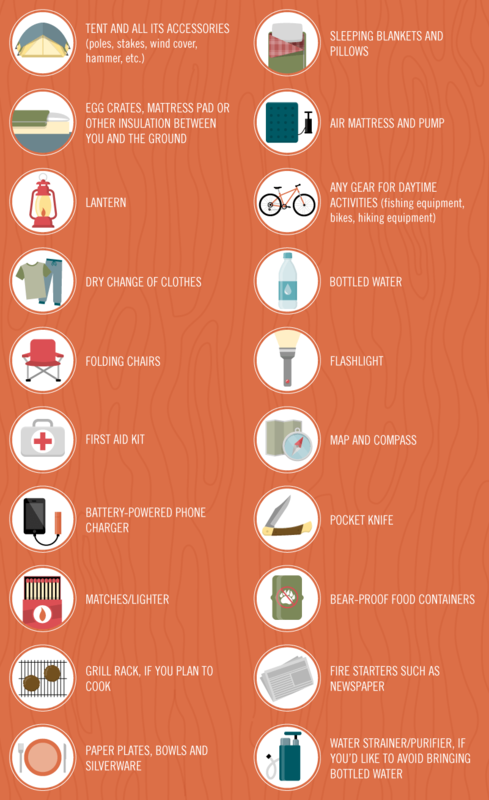 That, plus the 20-item list of necessary camping items makes this a must-see infographic before your next camping trip! I’ve included two of the graphics below but be sure to check out the original Camping Tips post over at the Personal Creations website for additional tips and info. Here is a graphic showing how to start a fire. If you’ve ever camped, you know how vital a task this is. It’s easy to forget to bring something….I always do. Check out this handy list of items to bring camping. What Should You Educate Your Children On First?